DESCRIPTION: Feb. 14, 2006. Boston, MA. Bishop Teixeira, Diocese of St. Francis of Assisi. Approximately 200 immigrants, U.S. citizens, and community leaders gathered outside of Faneuil Hall to denounce the Sensenbrenner Bill, HR-4437 the Illegal Immigration Control Act, passed by the U.S. House of Representatives in Dec. 2005. Speakers insisted that this legislation scapegoats immigrants, destroys immigrant families and would encourage racial profiling while ignoring the substantial economic contribution of the immigrant community and urged Congress to pass a more balanced and equitable comprehensive reform policy that would create legitimate paths toward citizenship for undocumented immigrant workers and families . 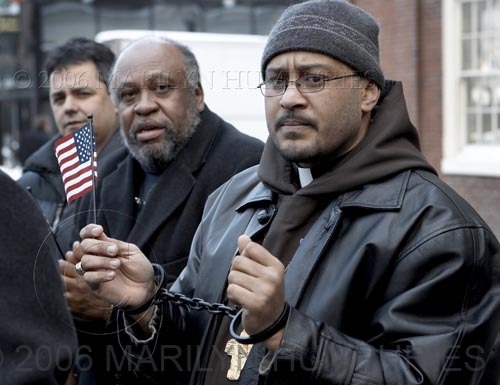 Liberty and speakers stood in handcuffs, symbolizing the effects of H4437 that would classify countless ordinary US citizens and immigrants alike as criminals.